On a Monday morning, I was playing Dragon Quest XI and scrolling through Erik’s weapons to switch from Boomerang to Sword when something finally dawned on me after 26 hours of playing. You see, usually when I do this weapon switch with a character like Sylvando it also involves putting a shield back after using a two handed weapon, so I’m in the habit of checking the other non-dominant hand is equipped with what it needs to be regardless of what kind of weapon I’m switching. For Erik, this usually involves me being told I don’t have anything to put in his right hand even though I have a few spare shields, which made me realise something. His character holds his dagger on the left and he can’t hold the shields that the other right handed characters can hold in their left. It was then I had the realisation that the Dragon Quest team probably make a conscious decision to impact gameplay with Erik because he is left-handed, a tidbit I found pretty amusing. There seems to be enough evidence to support that Erik is left-handed, despite the fact I couldn’t find anything directly confirming it. When you equip a dagger, it clearly says its going into his left hand and when the game tells me I can’t give him a shield, it tells me I have nothing to put in his right and although he can get abilities that involve using both of his hands later, his left hand usually deals more than his right from what I’ve seen. 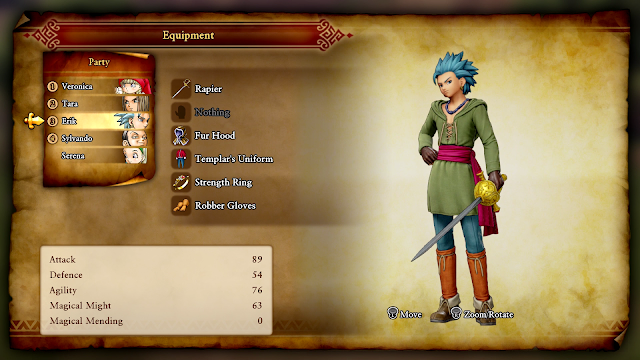 Whether or not there’s a reason he can’t equip a shield is something I wonder about, such as if it’s because he’s a thief or otherwise, but overall discovering and being overly amused by this little fact made me realise how much I love the subtlety of many little things in Dragon Quest XI. It might not be a useful fact and I’m not even left-handed myself so I’m not sure why this was the fact that made me appreciate the detailed world so much, but I do think it’s a good example of the thought and love put into making Dragon Quest XI and I’ve only come to find more little things like that as I continue my journey. While looking for books I could read on the shelves in random houses, I found there are also clothes in the closet to pick up, and while charging through fields while using the horse, I noticed you can not only speedily bash down small enemies in front of you, but that the game is also smart enough to know that a horse probably can’t speed charge into big, strong enemies like dragons or ones stronger than your party and expect to get away safely. This isn’t to mention that most of the NPCs in the world all have something interesting to say - whether it’s commenting on the story content or telling you about their interesting little lives, the NPCs might look similar, but each feels memorable and like they have their own personality. Partnered with already deep world-building aspects such as weather, day and night cycles and the distinct visual styles of each area, Dragon Quest XI’s world has many small touches that make it feel like a deep world. And with my recent discovery of Erik’s dominant hand, I’m wondering how the world will give me more things to be awestruck about as I continue my journey in it. I’m about 30 hours in as I make this and I’m still finding more things sprinkled around the world that make me curious. Being able to look at books on the shelves was only a recent discovery in my journey, I keep seeing this cute little ghost guy running around things like treasure that is yet to be explained and I’m sure more cool things will pop up as I continue my journey since it only just told me how I can use the medals I’ve been finding since a few hours into my journey. 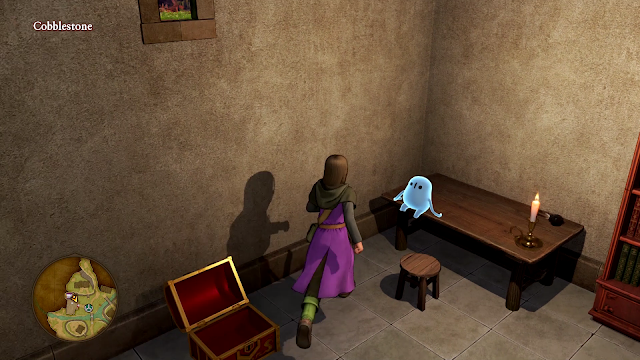 All in all, I love how much thought seems to have been put into the little details of Dragon Quest XI and I love how not all of them need to be explained; they’re just little touches that make the world feel deeper. I’m excited to keep playing through its fun world and as I do, I wonder what little surprises it will show me next. You can pick up Dragon Quest XI on Amazon! Are you enjoying Dragon Quest XI? Did you know that Erik was left-handed?